The metal hoofsteps of the armored guards and the jingle of keys told her without even looking that her sentence was about to end, and even with knowing what was coming, she still proverbially held her head high. "Alright you filthy scum, time to walk your last mile"
"Already?" asked Harle calmly "Must I walk, I would think you blokes would know I prefer to fly and get there quicker"
"I'm not falling for that" commented the guard "only an idiot would let you fly away from this"
Harle laughed "You seem to think I'm daft enough to try and fly out of a dungeon surrounded by guards, maybe you really are a fool" she snarked, though she did not put up a fight. They lead her through the catacombs, as they walked other inmates cried out, whether curses or occasional praise at Harle. She clearly had her fans, but then only a Griffen of some report would be kept int he dungeon for a public spectacle instead of put to the gods when found in the field. The sound of chains being pulled and wooden planks moved as the massive gate slowly opened, flooding the room with sunlight, despite her time, harle still looked as if she had only been brought there moments before, her wings and feathered well-preened and her fur still silky without a speck of dirt or grime on her brilliant red and gold coat. Yes, even a pirate could have standards. Crowds were gathered along the fences as she was lead down the path like the criminals there was cheering that alternated for harle and for the guards. Sometimes ponies were not so different no matter what sort they were. Ho ahead stationed near the cliffs for simple disposal was the tall imposing gallows. This was where Harle was being led, and even now, in chains and surrounded by guards, she still held her head high. She was lead onto the wooden structure and the noose was slipped around her neck "Any last words?" Harle turned to look at them "Yeah, I pity you fools, Here I am, in chains with a rope around my neck, but I am freer than any of you, I refused to blindly follow a tyrant who would allow the events that leas me here to happen, forget about me, may the Gods have mercy on YOUR souls"
The Undertaker moved to his position, but just as things were about to start there was yelling about a ship coming around the cliffs, and despite the ponies' speed, the sound of a cannon was heard and a projectile knocked the hangman back from the lever, emitting a huge cloud of the trademark smoke Harle and her crew were known for. "We took our time, after all, you do love a good dramatic exit"
"Dont mind if I do, mate, though its a bit early to start" she smirked, looping her arm through the ladder and popping the cork, taking a quick sip of the burning liquid, though just as quickly closing it, not joking about not wanting to start drinking so early. Meanwhile up above the crew was fending off the guards and making good time from the cliffs, however, the massive swarm of pegasai behind them meant they had to maintain speed or get overrun. Harle saw this and laughed "Yer miles off!" she mocked the archer... but the arrow was not aimed for her, nor for her crewmate... instead she heard a *THUCK* and suddenly was treated to an express-ticked towards the trees below as the arrow pierced straight through the rope ladder. "CAPP'N!" called the Crewmember, out of desperation bringing out harle's satchel that he had carried with him in case things turned sour and threw it down after her, hoping the supplies in it would keep her safe enough to reunite with them. After all they had been through, there was no doubt in his mind that a simple fall, even from this altitude, could do more than piss her off... whether a blessing or a curse, there was no getting rid of harle. "We need to get her back, where did she land?" "Sir, I don't think that's a good idea... that's the Everfree down there!" There was a moment of silence before the commander just gulped "Well if the fall didn't kill her then the monsters will, no sense in wasting our stallions, let the everfree to our dirty work for us." She leaned against one of the nearby trees and took another swig from the decanter to help dull the pain. How it managed to fall that far with her and not break was a tribute to whatever unicorn had enchanted it. "Well, now that the hard part is over, I just need to get back to my ship," she said, even now keeping her spirits up despite the situation, she looked around and asked the woods "So where am I?" The Everfree was forever...free! That was how Pathfinder looked at it, anyway. She wondered if that was why it was named the Everfree? Was it ever not so free, or partially controlled? What would it be called then? The Partialfree Forest? Of course that was assuming her hunch was right and it was totally related to the lack of pony control over the region and not something else. She couldn't help but feel that she had once known the answer but that, like so many other tidbits and facts that weren't immediately useful to her lifestyle, she had at some point replaced it with more useful knowledge. Like how to tie a rope around a Tatzulwurm's lashing tongues while sick with the Tatzul-flu. Or how to make pea soup without a water source! Really, she figured naming conventions that weren't about the names of artifacts or adventure locations weren't very important names to remember. In fact the more she thought about it, the Everfree Forest may as well just be called Cool Forest. Because it was cool and fun and full of danger! She needed a cool boost of fun and adventure. Ever since her marriage to Snowfall she had an adventure shortage, a danger drought! The worst type of drought a pony could ever possibly go through. That wasn't to say that there weren't some awesome stuff she got to experience in her married life. She was the best CEO mare of all the CEO mares and even beyond Snowfall was probably the best mare ever even outside of that. Biased? Yes. Very biased. But that didn't stop it from being very true. They had a long and extended honeymoon and then Snowfall kinda-sorta trapped her in a hospital for many long-needed surgeries and healing. She supposed that made sense and all and she was appreciative of Snowfall's idea of 'recovery' but that didn't mean she liked being cooped up in the city of Stalliongrad. When she felt good enough to adventure again- and Snowfall was at work- Pathfinder made some dinner, packed her things, and went on an adventure! Yay adventure! Snowfall probably understood and when Pathfinder came back with some cool stuff and/or fun stories she'd be super happy. That was why they got along so well! So Pathfinder was just zipping along the Everfree and enjoying the sights and sounds. She had a list of places she wanted to hit back up as well! Some of them were old haunts that she hoped had their traps re-armed. Others were simply places she wanted to check out. Maybe she'd find something cool! Always unlikely but the hope was enough to sustain her eternally. And today was one of those days when hope could be substituted for cold, awesome fact....because little did she know she w2as gonna run into a pirate! Yarrr! They weren't as cool as adventurers but they were still pretty sweet nonetheless. Oh, she knew who this was! “Hey there, Harle! I thought today was your big execution! Decided to give them a slip, eh? That's cool. Speaking from a pony who has evaded executions to a Griffon who probably just did, the evasion can be super thrilling!” She said as she clapped her hooves together and started flying gently over to the pirate. Pathfinder was always happy to meet somegriff who was cool, at least half as cool as that, as Gilda, the Gilly Griffon she had adventured hard with in Talinopolis. After all, all the cool characters had to know one another, right? The visitor from the east would lick her hoof and then lift it up to feel which was the wind was blowing. Looks like today it was a spooky forest today! Everfree forest wasn't necessarily the talk of the town, it was more like the hushed whispers of the town. Stories of cockatrices, manticores, owl-bears, timber-wolves, snakes and hydras came to her mind and only brought a big smile to her face. So many potential new friends of different shapes and sizes! 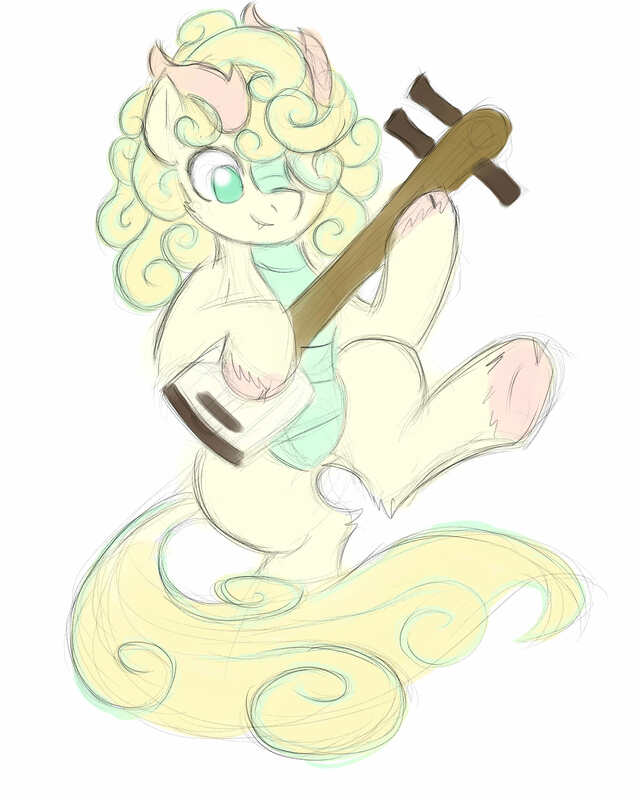 She wouldn't be able to understand their speech, but she could at least provide some sweet tunes for them to enjoy: Music soothes the savage beast and all that.... and there weren't many beasts more savage than those from Everfree. "Wow..." She pursed her lips and huffed, "I am -so- lost. This place is huge!" she called out into the darkness. Even worse than being lost... there were no beasts that had shown up yet. What was up with that?! She heard there would be all sorts of cool creatures out here. The scent of a magical menagerie hung in the air aroudn her and yet she'd not run into any of them? Were they scared of her? Did they sense her true nature? Well, she couldn't get any creature to come too close so she'd just have to push ahead until she found her way out of this maze of brambles and leaves. The mare's pleasant humming would echo around her for a while until she noticed the sound of someone else in here. Awesome! From her position she could hear the faint words growing closer, there were two voices in here. Based on the conversation she'd heard so far, the two must have only just run into eachother. Did they something about an execution? That sounded pretty thrilling to escape from. Around the corner the mare hopped into view and waved over to them, "Afternoon!" She eagerly trotted over to them, eventually coming to a stop in front of them. "I'm Yamakara, my friends call me Yama-chan! What brought you both so far out here? You say you escaped an execution? That is so cool! Did you both meet here to make some sort of daring escape?" The questions came out rapid fire, with almost no pause for breath in between. The curious dragonhorse seemed to bounce in place with energy before coming to an abrupt halt and staring down pathfinder for a second. "Hey... You look really familiar. I swear I've seen your face on a book somewhere..." Her muzzle scrunched as she tried to place it, "Are you that pegasus who goes on adventures? If you are, well I hate ot admit but this place is sort of a letdown! I haven't seen a single manticore since I got here and I should know, I've been here like half an hour now!... or was it three hours. Time sure flies doesn't it?" ...though somewhere deep down this just added to a growing pile of doubts harle had about her 'occupation' especially since most of her reputation was from her fiance's family slandering her or the over-glorified stories in the books... hell the most heinous thing she had done was burn down a tavern and that was really just a drunken accident! And then there was a flurry of sound as another voice joined this. And this time, Harle was even more concerned, given how this mare was acting, the Griffen would have sworn the pony was suicidal or at least off in the head... actually this one reminded her of someone... she'd seen a pony bouncing around and acting crazy at one of those fancy parts she had been to some years back before she began her career... in fact the pony in question had wrecked the place... a memory which made harle even more unnerved by this newcomer, even if she didn't really remember that pink menace from years past except for her curly mane. She sighed, "Aye, as ah was tellin this one here, twas my turn at the hempen jig but ah didn't much care for the tune they were playin" she reiterated for the newcomer, though she had let the coat fall back in place to cover her shackles. "ah dont 'spect ya might have seen a satchel round here, didcha? brown leather with me crew's flag as the clasp, fool first mate o' mine toseed it down after me and tartarus knows where th't hing landed..."
Before she could reply to the pirate captain they were joined by a new companion on this trip into danger and adventure. Cream colored Kirin who called herself Yama. Sounded good to hear! She expressed some sadness that they were not being overwhelmed by mystical creatures and danger, so she was definitely up Pathfinder's alley. Talk about fun times, right? "Hey ya there Yama Lama! You chose a good time to adventure here if you're looking for cool companions to hang out with, you're in luck! 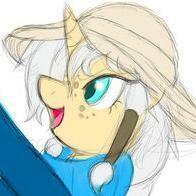 I'm Pathfinder, Daring Do Fanclub President and premiere adventurer. If you're looking for manticores then you're in luck, because you can find tons of Manticores...in their mating areas. Hilly places, especially large caverns. Less roaming around! Wanna go interrupt them? I'm sure it'd really rile them up and it'd be tons of fun escaping them," she offered as an option, striking her best Daring Do pose- which was pretty good, considering she had spent hundreds of hours doing it- before turning her attention back to the aforementioned pirate captain. "Pirate captains, monsters, ancient spirits unbound, corrupt Griffon military forces- its all fun when you're looking for adventure. Happy t see you got out of that. Death isn't all that fun, let me tell you!" She said before giving the restraint device a look. Not the worst thing ever, but then again, ponies were less cruel than others. She was pretty sure that she had something to help solve this little problem. "Oooh, that looks tough. At least they don't have spikes! Or they didn't inject you with a wing-muscle destroying chemical. That happened to me when I was in Talonopolis, not fun! Well, I mean, I did escape from an oubliette without use of my wings surrounded by hungry griffons so...it was actually tons of fun," she said as she dug through her bag. She finally found something useful. Hovering next to the restraining device she attached a small cylinder object and then twisted it. 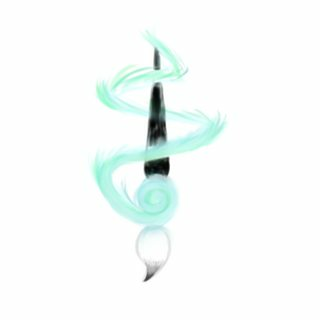 The object gave a whirling sound and Pathfinder's eyes lit up. "You should be fine. And hey, you know, a hurt wing is better than a trapped one if you aren't fine. Really its a win-win!" she laughed as it stopped whirling and...started to melt the metal. It grew smaller as it did so. Pathfinder took the increasingly small end that wasn't melting and moved it across the restraining device, hitting the hinges and hookups. Just before it was about to melt the very last inch she had a hold of she pulled it out and tossed it into a nearby pond, which hissed with steam venemously. She then quickly started to pull off the restraining device, lest the melted portions start to leak onto Harle. "There ya go! Don't think I burned your wings any. My hooves are a bit blistery but I don't feel them anymore anyway, so no harm, no foul. Anywho, wanna take this Neighponese tourist out to see some MANTICORES?!" She said as she grabbed the musically-inclined friend and pulled her in deep along with Harle for a group half hug of excitement and adventure. "Hmmm... I can't say I've seen any bags. Although I haven't really been looking for any since I started wanderin'." The kirin pursed her lips and furrowed her brow as she put her mind to work to come up with a solution. A bright grin that spread across her face seemed to tell that she'd successfully brewed one up! Harle would soon have the foreigner invading her personal space with her head tipped back and taking a deep breath through her nose. "I'm guessin' you smell pretty similar to your crew, right?" she asked as she took a couple steps back, "If so than I could probably sniff it out for you!" "I can actually smell something not unlike you a good ways off..." She sniffed at the air, "To... the Southeast I think." She gestured to a dip in the landscape of Everfree: a rather hilly looking spot with what seemed to be a large cave mouth visible in the distance. While Harle formulated her answer, Yama turned her attention to Pathfinder. Daring Do! That was the name of the mare she looked like. She was a famous adventurer archaeologist who saved the world many times over. "Manticores!" The whinnied in delight, " I can't wait to see some! I have so many songs I should expose them to! They sound so grumpy from all the stories I've heard. Maybe some good entertainment will cheer 'em up!" Before either of them knew it the instrument was out and the strange kirin began to play a strangely calming tune. She only played for a few seconds before stowing it on her back with an almost expectant grin.